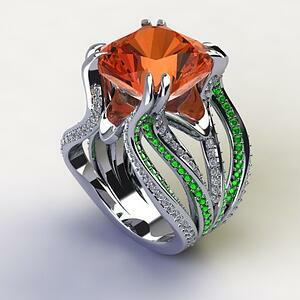 B9Creations sat down with veteran bench jeweler turned 3D printing master, John Haynes, to talk about his 2018 AGTA Spectrum Award-winning piece – a platinum Solar Blossom ring featuring a 14.3 ct. orange Zircon accented with tsavorite Garnets and Diamonds. Q: What inspired the piece? A: The piece is inspired by a sunflower, hence the name Solar Blossom, which means sunflower. The shanks that come up with the green tsavorite Garnets represent the leaves. The white diamonds are the sun reflecting on the outer ridges of the leaves. The reflector dish underneath are the petals. That's the organic look I was going for. 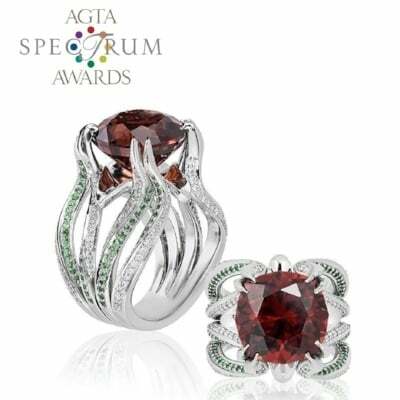 Q: What prompted you to enter the AGTA Spectrum Awards? A: We had an event called a Gem Tasting with a famous gem cutter a few days earlier, and my boss, the owner, bought an orange Zircon stone from him. One morning while I was working, my boss walked by my desk, slipped the stone on my paper and said, "See what you can do with that." So I had full reign, total creative freedom, to do what I wanted, and I really appreciate my owner instilling that confidence in me. On the paper, he actually wrote, "Design a Spectrum award-wining piece." So he spoke it into being I guess. Q: How long have you been a jeweler? What inspired you to get into the business? 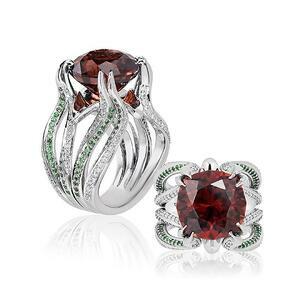 A: I've been a jeweler since 1980. I was going to school for engineering at ASU and decided to take a break. My uncle had a jewelry store in Texas and knew that I was artistic, so he invited me to come take a break there. I worked as an apprentice for about 4 years there, and I've been a jeweler ever since. Now, I work at Schmitt Jewelers, an independent, family-owned jeweler started in 1970 in Arizona. I've been with them for 6 years. I'm a bench jeweler, so I can design, set, and deliver a piece that gets the reaction you hope for. But now, I exclusively do a lot of custom designing, CAD, and 3D printing. Q: What did if feel like when you found out you won? A: It was very sweet because I was sitting in the hospital. My daughter was having a very extensive surgery, and I had no idea I had won. I just started receiving texts from friends in the industry, so that was really good news at the time. She’s doing great now. I was very honored to receive this award and very appreciative of the owners at Schmitt Jewelers for their confidence in me to give me total design freedom. The shop here did an excellent job assembling the piece, and I appreciate them as well. They are often the unspoken hero in awards like these, and I've been on that side of the award so I want to mention them. Q: How did your B9 Core Series help you? A: I would like to give B9Creations kudos with this piece. This is our third B9Creations 3D printer in this company. We bought our first B9Creator v1.1 in the summer of 2013. And then as soon as I heard there was a higher-definition version, I was certain I was going to get that. I went to Las Vegas and met with B9Creations founder, Mike Joyce, himself and handed him a check. He had not even shipped the B9Creator v1.2 yet. I was that confident in his machine. So then as soon as the B9 Core Series came out, I was on board to get that machine. We bought the B9 Core Series in the fall of last year and have been very pleased with it. I have operated 3D printers since 2000, and this machine really blows me away as far as speed, smoothness, and ease of use in every aspect. I love it.